This EXCLUSIVE BD/DVD Combo is LIMITED to 1500 copies, and is only available right here from our website. It will not be sold in stores. 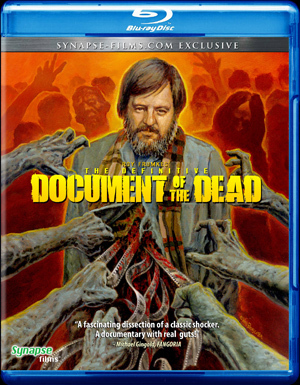 The release contains a DVD of the new version of THE DEFINITIVE DOCUMENT OF THE DEAD (along with the new commentary), as well as a Blu-ray of the ORIGINAL 66 minute 16mm 1979 version of DOCUMENT OF THE DEAD, created for educational use at The School of Visual Arts, remastered in high-definition. Also included in this limited edition combo is a fold-out poster, created by artist Wes Benscoter, of the new George A. Romero painting used on the cover art. Contains the new DVD version of The Definitive Document of the Dead, along with a high-definition Blu-ray of the original 1979 16mm version.